We've posted so many FREE downloadable patterns, pattern tweaks, printables, templates and e-books for doll clothes and doll crafts — and now you can easily find them all here on ONE page! Each item listing is followed by two (or more) links — the FREE download link and the newsletter entry and/or tutorial where the item was originally posted, and where additional information, directions and photos can be found. Please enjoy this FREE content from Lee & Pearl™, and be sure to bookmark this page and check back frequently! CLICK HERE to sign up for the Lee & Pearl mailing list. Along with our newsletters and announcements, you'll receive our annual FREE pattern for mailing list subscribers. 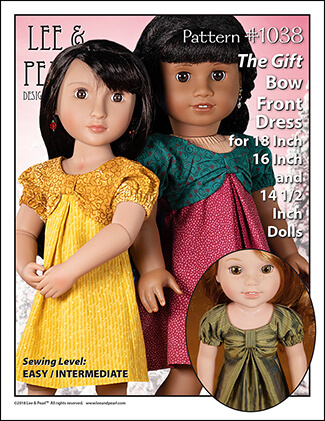 Currently, that's Pattern 1038: The Gift Bow Front Dress for 18 inch American Girl®-sized dolls, 16 inch A Girl for All Time® dolls and 14 1/2 inch Wellie Wisher®-sized dolls. NOTE: "Tweak the Pattern" downloads provide FREE altered pattern pieces for an existing Lee & Pearl™ pattern. To complete the tweaked garments, you will need to separately purchase that pattern.